The Prince Albert Highlanders Pipes & Drums is a recreational Highland pipe band whose primary purpose is to entertain folks with a variety of traditional Celtic tunes from the 1700, 1800, and 1900's. While we are not a military pipe band (but have many ex-military members), the tunes we play and our formal uniforms allow us to provide the respect and ceremony required for such functions. Similarly, because we are civilians, our informal "uniform" and repertoire also allows us to thorougly entertain and excite our pub-going audiences. We believe that our audiences have fun when we are having fun. 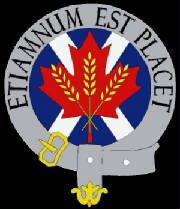 The Prince Albert Highlanders Pipes & Drums was formed in 1983 with a government grant and donation by the Prince Albert Optimist Club. 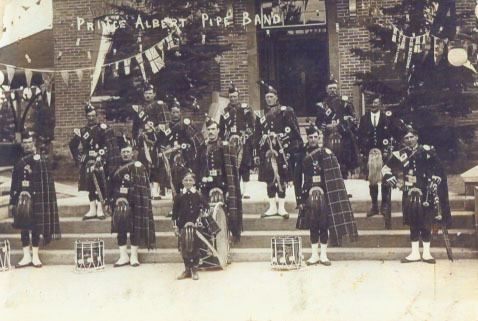 Founding members of the band, Howard Finan, Scott Meekma, and Dave Monette created Saskatchewan's northern-most pipe band and obtained second hand highland regalia from a Calgary pipe band that was folding. Since its formation, the P.A. Highlanders have played for audiences across Saskatchewan and Alberta. The band has also always welcomed visiting pipers and drummers into its ranks for practices, performances and parades. Our members include both women and men of nearly all ages. We come from Prince Albert, Shellbrook, Spruce Home, Duck Lake, Saskatoon, and other surrounding areas in Saskatchewan. We are also regularly joined by the finest pipers and drummers in the Battlefords, Meadow Lake, Saskatoon, Outlook, and Carrot River areas.